Armed with his large personal contact base, Justin specialises in selling property in Toorak, Armadale, Malvern and South Yarra and at the upper end of the surrounding areas. The confidence he shows in his marketing is infectious, and a property placed in Justin’s hands is as good as sold. In 2005, Justin was the winner of the Real Estate Institute of Victoria’s Senior Auctioneer Competition and the Australasian Real Estate Institute’s Auctioneering Championships, making him one of the most sought after auctioneers in the country. 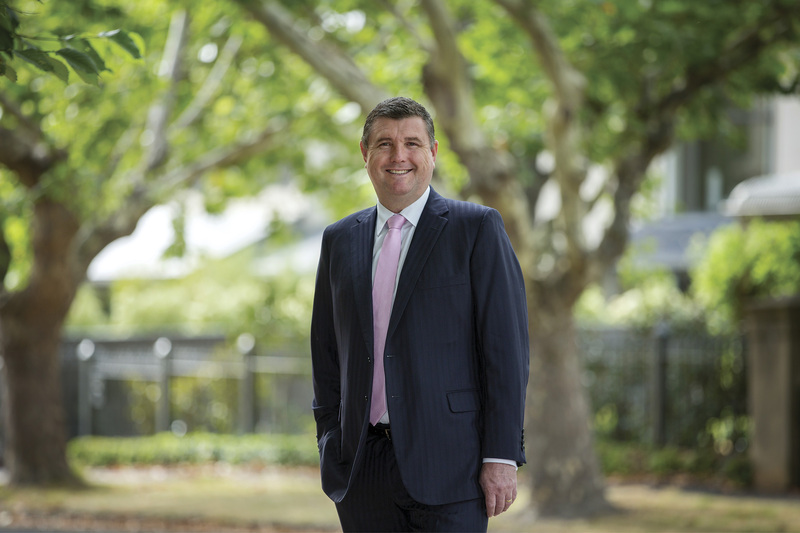 Having attended Melbourne Grammar School and University of Melbourne, Justin entered the Real Estate world in 1989. As a Director of Marshall White & Co., he brings to Real Estate an analytical approach tempered with a wicked sense of humour and dedication to achieving the best result for each successive property. Priding himself on his ‘client for life’ mentality, his results speak for themselves with over 75% of Justin’s business coming via repeat clients or referrals. Justin is married to Mary-Ann and they enjoy a varied social life with their many friends. To relax Justin enjoys spending time away from Melbourne at their farm in Trentham. Their four young children Christopher, Rupert, Oliver and Elizabeth also keep them very busy! Hi Justin, I want to thank you so much for all you did for us over the selling of my mother’s house. Your good advice and expertise were not unexpected but the friendliness and consideration with which your facilitated the whole process were an absolute bonus and ensured that everything went as easily, smoothly and pleasantly as possible for us. All your staff that we had contact with displayed the same qualities and mark was truly outstanding. I will thank him personally. As for the auction itself you were absolutely awesome extracting further bids from people who had no intention of bidding higher. You really worked the crowd brilliantly. It goes without saying we were thrilled. And so Justin, a big thank you from us all. You have our business for life! Elizabeth and I were delighted with the lead up to the sale of Elm Grove and equally delighted with your auction. You and Peter formed a very professional team and left no stone unturned to ensure that we got a good price. We would certainly recommend Marshall White to any of our friends who intend to sell their house. From the process of preparing our house for sale to the actual auction, we were given sound advice to guide us. We always felt supported and we were never pressured to accept less than what we thought our property was worth. The sales team were extremely professional and polite at all times. We were very happy with the outcome in the end. In summary, Marshall White Real Estate Company were a fabulous team and were 100% dedicated. Really, job well done!!! Dear Justin, Thank you from the Burns family, 14 Jessamine Avenue, Prahran will no doubt star in the Marshall White book of legendary sales for some time, but will be remembered in the Breen Burns and Burns family history as a deftly managed campaign, of intuition and flash of genius, with a stupendous result from a virtuoso auction performance on the day! I wanted to thank you for all your efforts in the recent sale of our Property. Deciding to sell your most valued asset is not an easy one, especially when it was the product of such meticulous restoration. We were indeed proud of our end result and when we finally made the decision to sell our search for the "right" team to manage the sale our search was not a long one. Justin, your knowledge of the area and your assessment of the events as the quest for a buyer for our home progressed was invaluable. You were ably supported by Richard and Susan. Your time frame on finding the "right" buyer for our niche home was spot on and I remember your reassurance along the way. The feedback, advice and attention especially in the days just before the sale really reconfirmed the decision that we made in choosing your firm. I still recall the conviction you had on the morning of the boardroom auction.... We followed your advice and the end result was more than we expected! To you, Richard Mackinnon, Susan McGlashan & the rest of your team I thank you for your hard work in achieving the result you did in such a hard marketplace. I wish you all the very best in your future endeavors. Dear Justin & Dean, Just a note on behalf of Janet, Glenda and myself to express our appreciation of your excellent work in achieving the sale of 33 Stuart St, Armadale. Your advice pre-sale was sound and helpful and preparation for sale produced strong interest and a great crowd on the day. The result exceeded our expectations. Thank you again and keep up the good work. Justin Long and his team at Marshall White auctioned my property at the end of August and successfully sold the property after the auction, carrying out the post auction negotiations professionally and working hard to maximize the sale price. I have known Justin for over 25 years and have always found him a very honest, trustworthy and ethical person who is consistently happy to give support, help and advice, using his considerable expertise. He and his team worked very hard to sell my property well and achieved many viewings. They also gave me a lot of help and valuable advice with the business of preparing the property for market. I am pleased to recommend Justin and his to team to anyone selling real estate. Dear Justin, Eliza and I would like to thank you and your team for helping us to secure our new home and selling our old home. From the time I met you in 1994 you have always endeavored to keep in touch with us enough to keep us informed of the market conditions, which has been appreciated. Eliza and I are particularly grateful to Jason Brinkworth who patiently worked with us over the past 3 years to identify the right land for us to purchase and build our new home. Jason definitely had his ear to the ground and knew his market well, which helped put us in a position to secure a very rare piece of land in our favourite street in Glen Iris. When it came to making a decision to sell our fully renovated house in Britten St, Glen Iris there was no shortage of agents knocking on our door. The Marshall White team including James Redfern, Jason Brinkworth and yourself provided honest and frank advice, which enabled us to make our decision based on well considered facts. Your teams marketing strategy included first class marketing material which presented our home in the best possible light. In fact the house looked so good we were sad to say goodbye to it. We must also say thank you to Georgina Cameron who did a terrific job coordinating the campaign. When it came to Auction day we were a little unlucky, however Jason and James did an outstanding job. I was particularly impressed with James who held the line on the price and persisted with the post Auction negotiations for over an hour until we got the result were targeting. Thank you both, Justin and Trevor, most sincerely for a wonderful result at our auction yesterday. You certainly knew your target audience and guided the auction perfectly to reach the best possible result on the day. The whole process has been seamless and knowing the reason behind the sale, you have treated us gently and respectfully throughout the campaign. I am very grateful to you both for this and it has made the packing up and selling up of my lovely Mum’s house a much easier process for me. For that I am extremely grateful. It was our lucky day when we met up with Peter Bennison and asked him why an apartment that Marshall White was handling was not open for inspection. Peter was most helpful and arrange for us to see over the building at a time to suit us. Through Peter’s company he arranged for us to look over another apartment in Clendon Road which turned out to be just what we were looking for, so we paid a deposit for the unit. As we now had to sell our house it led us to discussions with Marshall White, meeting with yourself and the rest of the team who took us down the journey to the most satisfactory auction. Jill & I found the experience most professionally handled by all the members of the Marshall White team who were involved in our sale and we thank you for making the sale so stress free.